The bulkcarrier ARAMIS along side the cement barge SEAMENT VI in Tilbury 6/87. RWJ ? 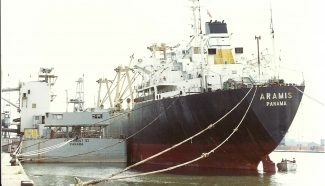 The bulk carrier ARAMIS (16,158 tons gross, 27,804 deadweight) started life in 1987 under the Liberian flag as FAUSTINA. It was bought by Em Pothitos, of Athens, Greece, in 1983, placed under the registered ownership of Compania Sydenham, of Panama, and managed by Pothitos Shipping (London) Ltd. It took on the new name ARAMIS. It was sold in 1989 to become TSOUNA, was briefly named IHTHIS in 1992, and TERAMO in 1992-93. It was broken up at Shanghai in 1993.